One Dollar Gold Coins: Best Investment Ever ? U.S. government has decided to honor all the Presidents by issuing $1 gold coins. The United States Mint will mint and issue four presidential $1 coins per year. Every three months, a different president will be featured on the coin, starting with George Washington. After three months are up, the coins for that particular president will no longer be minted and the minting of the new presidential coin will be released. Rant: My only concern is that, this could lead to more scams. How about melting these gold coins to sell it for more than its worth ? Iran holds 11% of the world’s oil reserves. Considering this fact, everyone would expect Iran’s output to grow. However as of now, Iran’s output is only 3.9 million barrels/day versus over 6 million barrels/day in the ’70s. Iran is facing a natural output decline of 8-10% per year due to lack of investment. Oil sales of $47 billion in 2006 generated half its government’s revenue, but lack of refining capacity means that Iran imports 40% of its gasoline. It spends $20 billion/year on gasoline subsidies to appease its population which has led to domestic demand growth. If demand continues to grow at current rates, some analysts predict Iran’s oil exports will dry up within 10 years. Royal Dutch Shell RDS.A and Repsol REP recently agreed to develop South Pars, the world’s largest natural gas field. France’s Total TOT is also in talks. Rant: Is Iran’s problem a global problem ? Rant: Technology and telecom sector is going through a golden phase. Two third of the S&P 500 exceeded analyst estimates is a clear indication of strong economy. The question is, can it keep up in 2007 ? Wells Fargo WFC is offering their customers 100 free stock trades per year, which includes trading ETFs and no-load mutual funds. Rivals, Bank of America BAC offers 30 free trades per month, equivalent to 360 free trades per year for clients having $25,000 in deposits. However Wells Fargo offer includes loan balances and money in brokerage accounts in addition to cash deposits when totaling its $25,000. This will add more pressure on other brokerages like Charles Schwab Corp., E*Trade Financial Corp. and TD Ameritrade Holding Corp to cut trading costs. Rant: This is good news for passive investors who trades just about 100 times in a year. Investing made easy – Monthly indicator !! Stock market can be a confusing place most of the times. Wouldn’t it be nice if we had some rock solid indicator to show us the way ? How about a S&P 500 monthly market indicator showing past 6 decades ? 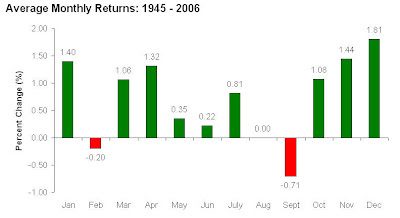 The chart indicates green for 10 of the 12 months, the month of December being the best. The month of September has been disasterous and i would definitely keep away during that period. Interestingly the month of October has a pretty good upward jump. Conclusion: Seasonal tendencies in the market are always good to be aware of. The month of February has started positive. However if the chart holds true, we might see some drop towards the end of the month. Recommendation: Historical data over such a large period of time can be a helpful indicator for future trends. This being the month of February, as per the chart trade cautiously.